Q: What should I look for when hiring a floral designer? How many weddings like mine do they do each year? Make sure you are hiring a wedding specialist. Not every florist caters to weddings. You want to make sure that the company you hire specializes in weddings so they are familiar with all the intricacies and details they must cover from timing of deliveries to specific requirements at venues and religious sites. What services will they provide? There is more to wedding flowers than the flowers. A couple deserves service. You may want some or all of the following services: Personal consultation meetings, written proposals, sample arrangements, delivery to each venue of your wedding, pinning boutonnieres and corsages, set up of each venue, and moving flowers from ceremony to reception. Make sure you hire a company that will provide all that you want. Will I work with one person from start to finish? Make sure that the person you meet with initially is the person who will oversee all the details of your wedding. You want continuity. You want to develop a relationship with one person so that you can be sure that they are responsible for all the fine points you discussed with them. This way nothing can get lost in translation. Can I see examples of your work? You want to see photos or actual arrangements that the designer does. Make sure they have a portfolio of their work, not just photos from books and magazines. Q: Do I have to know the names of flowers? A: No- – that’s the floral designer’s job! They know the names and should also know the seasonal availability. You may not know the names of flowers, but you know what you like and dislike. Before you meet with your potential floral designer, look through for photos online and in magazines to see if there are styles of arrangements you enjoy. Bring pictures or appropriate website links to the consultation. A great exercise to do before you meet with a florist is to think of some adjectives to describe your personal style and the type of wedding you want. Words like dramatic, romantic, elegant, fun and simple all conjure up different ideas. Those ideas will help the floral designer choose the best varieties of flowers to create the look you want for your day. Q: What steps do I take for planning my wedding flowers? A: At Jeri Solomon Floral Design the planning process starts with a brief telephone conversation. I personally speak with every client, I answer any initial questions and then we schedule a consultation. During the consultation we spend 1.5 – 2 hours at my studio in Stoneham reviewing my portfolio, discussing every part of the wedding for which you need or want flowers. We will be as specific as we can, knowing that wedding planning is a fluid process and things will change as the “big day” approaches. At the end of the initial meeting I will present you with a “quick estimate” with itemized pricing for every piece we discussed. You can take this estimate home and use it to make your decision to engage our services. 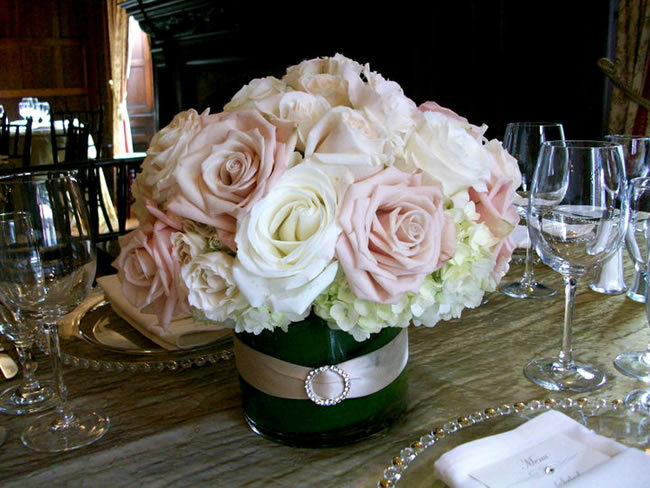 Once you know you want to hire Jeri Solomon Floral Design we will send a detailed proposal and contract. You will secure our services with a deposit. Then, as your wedding date comes closer, we will finalize details. This may involve additional meetings, site visits and sample arrangements or many e-mail and phone conversations. Q: What should I plan to spend on wedding flowers? Since every wedding is custom designed for the individual couple, there is no definitive answer. We can, however, give you some general guidelines. For most of our clients, flowers are a top priority at their wedding. If you are planning an average size wedding expect to spend between $35.00 – $75.00 per guest at your wedding (inclusive of tax and service/delivery charges.) Of course, it is possible to spend more or less. If you have a particularly large wedding party or require a lot of décor for the ceremony or have an exceptionally small or large number of guests, this formula may not be valid for your event. During our initial telephone conversation I can usually give you a good estimation before we schedule a consultation.